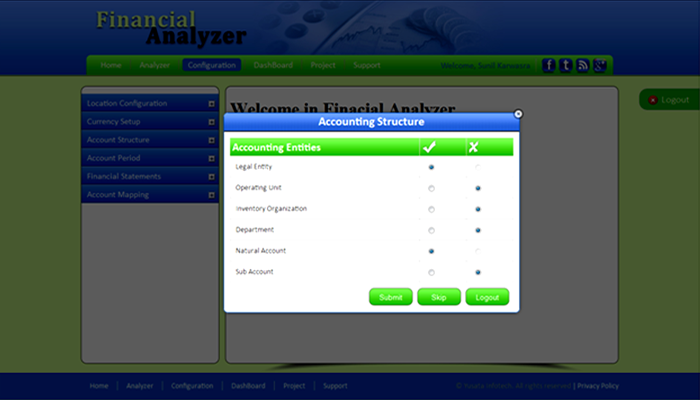 Financial Analyzer is online solution to identify financial strengths & weaknesses of the firm by analyse profit & loss account and balance sheet. Analysis of financial statements is an attempt to assess the efficiency and performance of an enterprise. Financial statements are usually complied on a monthly, quarterly and annual basis. 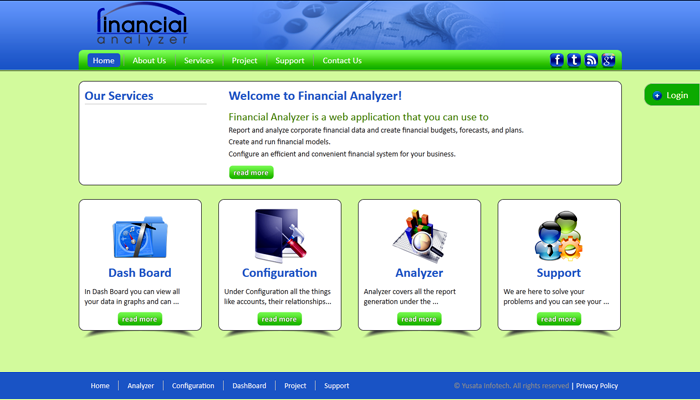 • Report and analyze corporate financial data and create financial budgets, forecasts, and plans. • Configure an efficient and convenient financial system for your business. 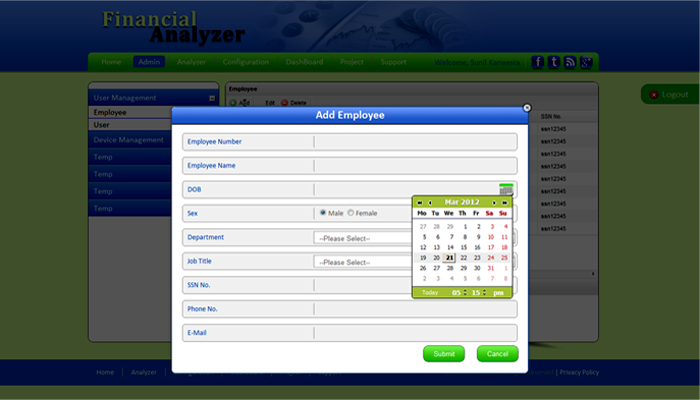 Financial Analyzer provides functionality to define organization's account structure. Any of the provided entities can be selected to be used throughout the application for account mapping and reporting purpose. 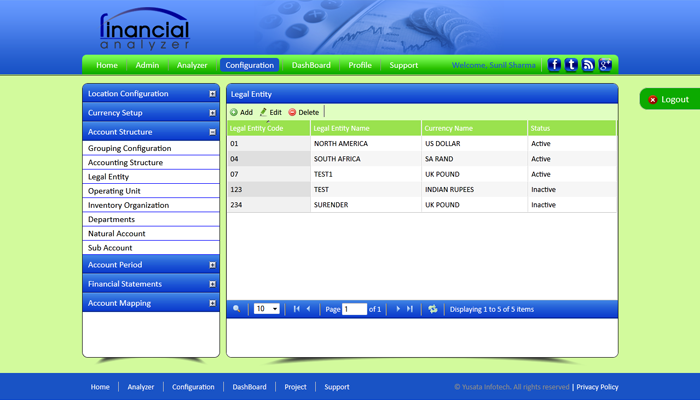 Administrator or User can configure account settings such as location,currency,financial statements. Financial analyzer provides functionality to generate and analyse report and export report in pdf & excel file on financial statement Cash Flow, Balance Sheet, Profit & Loss. 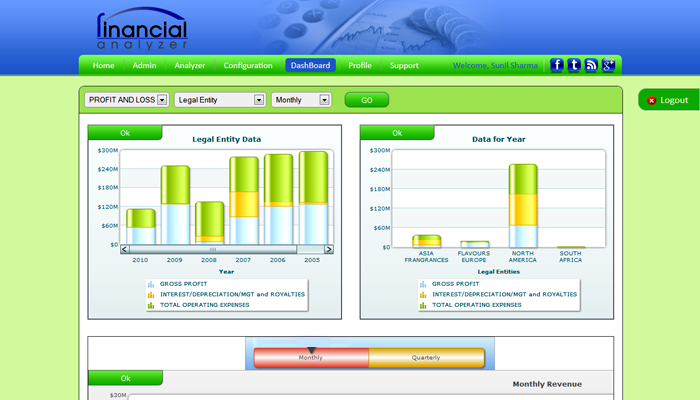 Dashboard provides facility to generate charts on different criteria such as by divison, yearly, monthly etc. Charts can be drill down in all dimension. We can export chart into pdf,jpg and png file and view also in data grid format. Administrator and user can view financial statments data in a grid format till certain level on different criteria and can export data in excel or pdf format. 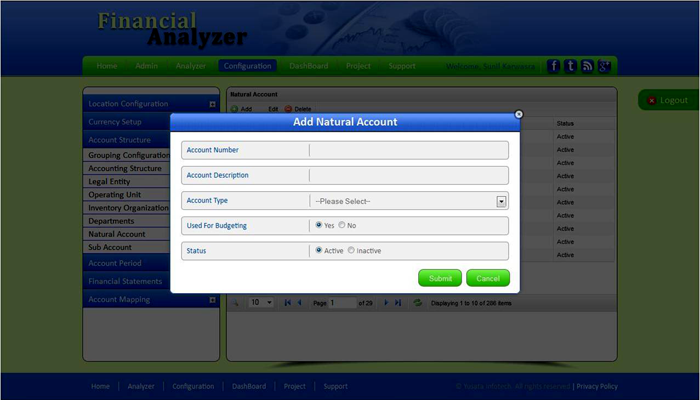 Financial Analyzer is online solution to analyse profit & loss account and balance sheet. Dashbaord display charts to shows data of different financial statements. 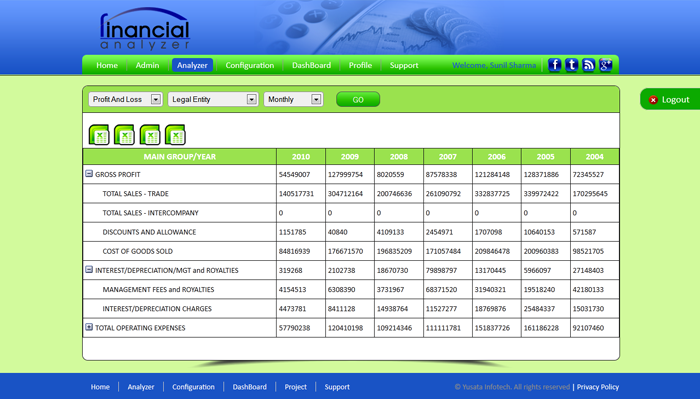 In Configuration panel, account structure allows configure grouping ,leagl entity, operating unit, departments and accounts. 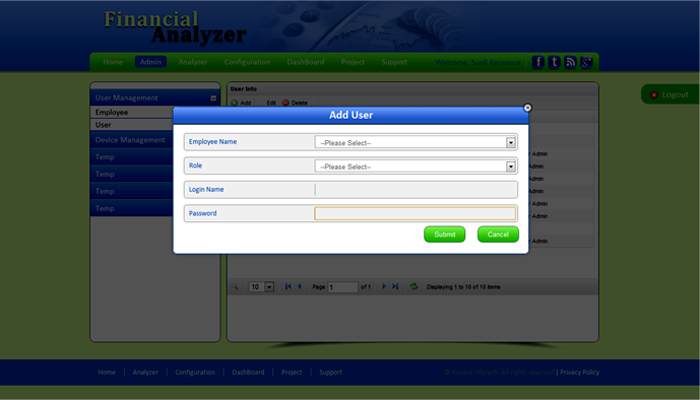 Analyzer panel, allows user to view and export data in pdf and excel file of finanacial statements. Admin panel, allows administartor to configure default setting such as profile,device registration etc. 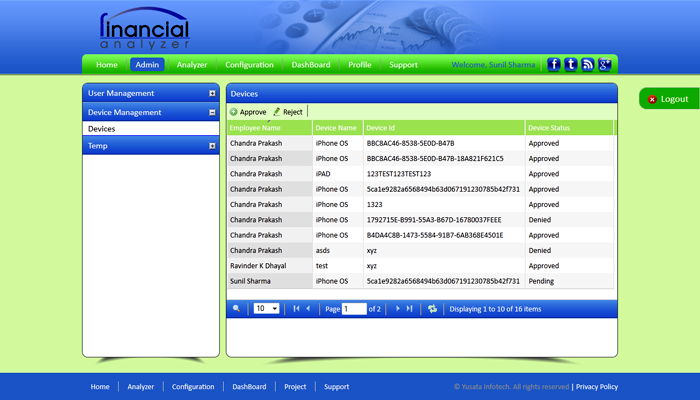 Admin panel, allows admin to add user,employee and device management. Adminsitartor can add/edit employee with some essential details. Accounting Structure allows admin to configure default structure on which basis data analyze. 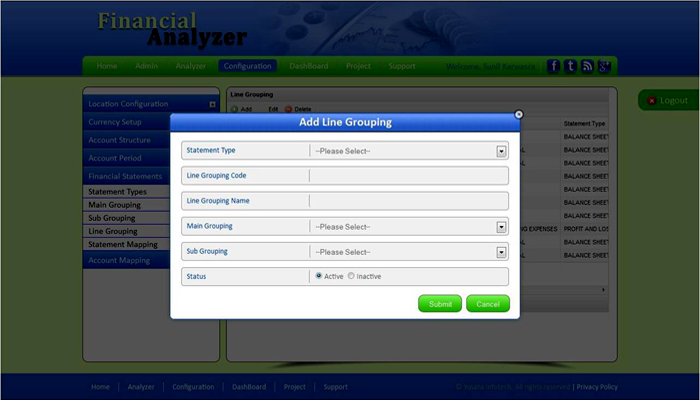 Admin can add/edit line grouping, which allows user to see data on lower level. Admin can add/edit natural account of company, and specify will it use for budgeting or not. In Configuration panel, account structure allows configure..